Originally established in 1825 as a steam-operated brewery, it was restored in the late 1990's to produce specialised fruit beers from a micro-brewery known as Melbourn Bros. All Saints Brewery. It has a coffee lounge, restaurant and brewery shop and is open for guided tours and tastings by pre-arrangement. Dating back to the 13th Century and rebuilt by the Brownes after suffering damage during the Wars of the Roses, this striking church in Red Lion Square has Browne family memorial brasses, a carved angel roof, stained glass windows and a reredos of the Last Supper. Open daily. A well-preserved and picturesque cobbled stoned street nestled behind All Saints' Church. This setting provided key locations for the BBC TV series Middlemarch and the Merchant Ivory movie (2000) The Golden Bowl. Now private residences and guest rooms. The wealthy wool merchant, William Browne, and his wife, Margaret, founded this almshouse in the late 15th Century to house 10 poor men and 2 poor women with a Warden and a Confrater, both of whom were to be priests in holy orders. Despite extensive 19th Century restorations much of the medieval stained glass, original furniture and archives remain. Open weekends and Bank Holidays May-September. Burghley has been holding the Autumn 3-day event horse trials on its estate since 1961 when it ceased to be held at Harewood. It holds the record for the staging of championships on an international horse trials site, two world championships, six European and one Young Riders European, and is the longest, continuous running international event. Regarded by many as the finest Elizabethan House in England, Burghley House was built in the 16th Century by William Cecil, the first Lord Burghley. Now in the hands of Lady Victoria Leatham, this stunning house, extensive grounds and sculpture park are open to the public over the summer period. The Mid-Lent Fair appears to have been held for over a thousand years, dating back to King Edgar�s days and provided most of the town�s trade and a major source of income. Nowadays it is a huge funfair which fills most of the town centre from Bath Row to the High Street. It is held on the Monday following Mothering Sunday and runs until the following Saturday. During March. The Arts Centre houses a theatre/cinema, assembly room, caf�, art gallery and tourist information centre. The assembly room, complete with chandeliers, dates back to 1727. The theatre was added 51 years later and is one of England�s earliest provincial theatres. Originally called the Water Meadows, the Meadows is pleasant place to picnic, recreate, watch or feed the birds. It provides level walking along the River Welland, where you�ll find the Boudicea plaque recording her pursuit of the Romans, and is the starting point for the Jurassic Way. There are footpaths to Easton-on-the-Hill and Tinwell. 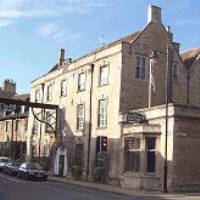 Stamford Museum sets out the history and archaeology of the town from its earliest times to today with displays, exhibitions and galleries. The museum organises a yearly series of public lectures which are extremely popular, and its archives are available to view for researchers and students. St. Leonard�s Priory was founded in the early 12th Century by the Benedictines of Durham Abbey. Its purpose was to manage the order�s southern estates and prepare students for entry into Oxford University. It fell into disrepair following its dissolution in 1536 and today all that remains is the nave and arcade of which the magnificent west front is a feature. An important coaching inn in the 17th and 18th centuries and possibly dating from the 10th century. It flourished until 1461 when Lancastrian forces destroyed much of the town, however the main block was rebuilt in 1597 by Lord Burghley, hence his coat of arms over the entrance. Famous guests include King Charles I, William III and Sir Walter Scott. Whether you have just a few hours, a day, a weekend or longer, Jill Collinge can introduce you to the Georgian heritage, the medieval Stamford, the personalities of the town or to the fine churches.